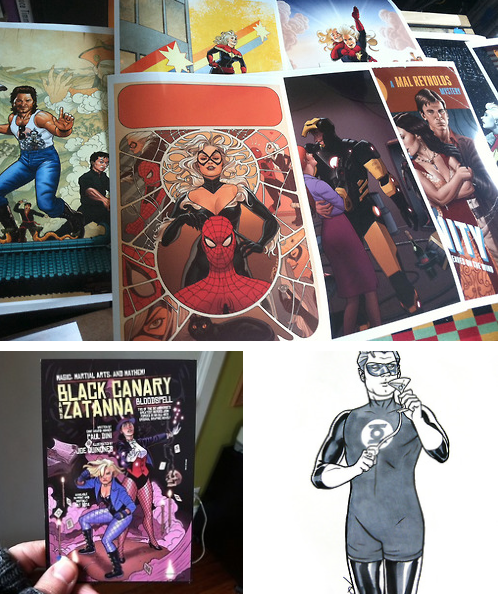 Joe Quinones' interweb-log: Emerald City Con: This weekend! Emerald City Con: This weekend! Emerald City Comic Con is this weekend! I’ll be there all weekend alongside Maris Wicks at table C-13. You’ll know your close when you spot the long, long lines waiting for Kelly Sue DeConnick, Matt Fraction and the Allreds :) — they’re all seated along the same aisle as us. Excited to be returning to this awesome con and city once more. I’ll be up to my usual con activities, selling prints and taking on commissions. 11x17” prints will be available for $20.00. I’ll have a variety of them on hand, but please don’t hesitate to drop me a line if you’d like me to print one out custom for you to pick up at the show. I’ll also have these nifty little postcards with me advertising the release of my upcoming graphic novel, Black Canary & Zatanna: Bloodspell. They’re free, so swing on by my table to pick one up. On Sunday from 12:10-1pm in ‘Hall B’ (608-609) I’ll be participating in a game show called “Challenge of the Super Friends,” hosted by comic artist Gregg Schigiel. The show is comics-themed (naturally) and will feature myself, Jay Faerber, Chris Giarusso, Brad Guigar and Maris Wicks as guests. I hereby predict my losing all of the games. Badly. And that about does it. Hope to see you there, folks!